They are also mainly subscribed by non-profit organizations with a specific cause, but wishing, as it was explained to me that day: “ne pas reprendre d’une main ce que l’autre donne” (not to take back with one hand what the other gives). The event was well organized and featured passionate speakers. Associations and foundations came to present their cause and passion for socially responsible investment. But as the day unfolded, I felt a doubt rising. Not on the honesty or the benevolence of the speakers, even less on their competence, but on the meaning of all this as it was presented. Because in the end, does socially responsible investing, as it is mainly practiced, make sense? It is kind of counterintuitive but yes. Let me explain. The first interrogation I had, and that the speakers did not really address, was this : if socially responsible investments have a concrete social effect, this social effect necessarily has a financial cost. It is inevitable, ESG investors must necessarily “give” part of their return to pay for this positive social effect. It’s even healthy. So what is its cost? In more technical terms: what is the underperformance of ESG funds? Yes, because if the fund actually have a limited or no social effect it is perfectly normal that they do not present significant underperformance. So when I hear: “It’s great, you can invest responsibly and it does not cost you anything”, I sadly think “It’s a shame because it probably just means that it has no effect.” In fact, unfortunately, even then it costs: analysts, managers, specialized services, time and resources not used to support the main cause of the association or foundation. So we end up with two possibilities, none of them being really satisfying : 1 / the ESG funds have real influence and in this case they cost out-performance or 2 / they do not but still cost analytical resources . It appears, according to various studies produced by the ESG fund industry itself, that the reality is closer to the second possibility, a lack of underperformance (which they think is a good thing, but is not). The underperformance of ESG funds should be material and recurrent to validate the impact of their social action. Its non-existence, if it is further proven, is probably a sign of their lack of impact, either because they are not large enough for now or because of the lack of effectiveness of their activist policy. You have to make choices because you can not be responsible for everything. The most responsible decision is often subjective, and has very often negative side effects. Worse, and this is the case in this simplistic example: most of the time it is impossible, due to a lack of sufficient data, to know what is the most responsible decision. Another, more serious, example : should we favor the fight against global warming (future generations) or the fight against poverty (contemporaries)? We would like to do both but is it always possible? When China produces large quantities of electricity from coal-fired power plants, the country clearly makes the choice of fighting poverty through economic development, but oh my the ecological cost! So there is a real contradiction in the total social activism of ESG funds. Wanting to do all the good is unrealistic, choices are inevitable. From a practical standpoint, it is impossible for ESG funds to claim a fully socially responsible investment. So they work with the sole goal of having a good carbon footprint on their portfolio, leaving the rest a little aside. Even more worrying, concerning the “best-in-class” policy of ESG investments : it may seem attractive at first but is really counterproductive from a strictly political point of view. Indeed, if ESG funds only choose “good” companies and exclude “bad” ones, they miss the huge social lever that is to influence them, for the better. Responsible investors thus acquire voting rights in companies that have already become aware of the issues, and leave the others, the “bad” ones, in the hands of conventional shareholders, naturally less inclined to push socially responsible policies through their vote. What a waste ! Investors who are willing to pay to influence companies should to be able to give their opinion or better, their vote, where it would be the more meaningful ! An ESG fund, based on solid data and rigorous analysis, decides to discard an electricity producer because of a bad carbon footprint, linked to a production mix favoring coal, with an investment in R & D too low on desulphurisation, CO² capture or increase in thermal efficiency. In the “best-in-class” logic this is perfectly valid. 1. If the investment represents enough weight, by putting downward pressure on prices, it will offer arbitrage opportunities up to grab for conventional funds pocketing the difference. By simplifying, the responsible investors will this way indirectly give money to classic investors, not to their causes, while believing to do good. Oops. 2. Moreover, this will leave the governance of this “bad” company totally free to go on because no one will put on the agenda the choice to move the production towards renewable sources, potentially less profitable, or to invest in R & D on improving the carbon footprint, not even vote for it. This is why I am not convinced by the “best-in-class” policy chosen by most ESG funds. This is a shame because they all bear very good intentions, and the resources are there with more and more assets being allocated to them. OK. So what should they do ? …because all this is not very constructive I agree. 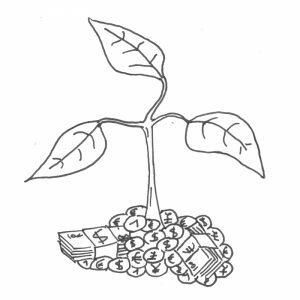 So what should socially investors and organizations do ? I would propose two more effective ways of maximizing the social impact of those assets. First they should choose and stick to the causes that they are entitled to defend, and second they should get involved in the fight for them while investing. 1 – The cause, nothing but the cause. Focus on your cause, and your cause only. A non-profit organization specializes in a particular social area, where it controls costs and measures impact accurately. Focusing all available resources on this unique cause is healthy. Resources are used optimally. To make it clearer: no ESG. The investment of the organization resources is in this case free. I hear the criticism : “what is the point of defending your cause if you are irresponsible elsewhere“. But here we must remember that traditional investing is not necessarily irresponsible. Investment is good for the economy, a solid economy is good for humanity as a whole. Greed and the lack of ethical investment is not, but one can very well invest outside ESG funds without being harmful to humanity. This also concerns the fiduciary duty of non-profit organizations. Clearly, when a donator gives money to an organization, he/she does so with the clear objective of supporting the very cause the non-profit defends. He does not decide to use this money to finance other causes through ESG funds, such as the fight against global warming, although he might be sensitive to it. His/her choice must be respected. Yes, because this is how socially responsible investments can make sense. Whether it is in parallel with its main cause, or even its main cause by itself, investing in social and environmental capital activism has a strong meaning and a real potential. Responsible investors should push ESG fund managers in this direction. This strategy consists in using the assets of the ESG funds to acquire not virtuous companies but on the contrary companies with insufficient ESG policies. The idea is to use the pooled financial strength of investors to positively influence the governance of those bad companies. Of course this means a significant weight to have a meaningful effect, but it can be started with smaller non-compliant companies. This way socially responsible investment could aim at a material influence: ESG fund managers would no longer be judges of ESG beauty contests but experienced lobbyists, with the mission of selecting and influencing targets with real potential for improvement. It would even be possible to create ESG funds that are not specialized by financial asset class (“European ESG Equity”) but by cause. This way organizations could invest in funds “ESG on climate”, “ESG for gender equality”, “ESG for the reduction of social inequalities”, and choose their cause precisely, in accordance with their policy while earning a lower but sufficient yield to finance their operating actions. They could even be paid to the impact they have on those companies ! Hard work, but I sure hope it will happen ! En faite l’idée serait de créer des fonds qui investiraient dans les société connus pour ne pas performer dans la cause choisit par le fond dans le but de peser sur ses orientations politiques. Peut-on vraiment encore parler d’investissement dans la mesure où le fond est décorrélé des performance financières de l’entreprise ? Ne serait-il pas plus “rentable” de financer directement des lobbyistes au niveau de l’État pour contraindre toutes les entreprises à corriger leurs défauts par la loi ? Les fonds ne seraient pas totalement décorrélés des performances financières de l’entreprise. Ils continueraient à prendre un risque capitalistique sur les entreprises en question et seraient rémunérés pour cela. C’est juste qu’ils influeraient pour le meilleur dans la gouvernance de la société, en poussant des stratégies potentiellement moins rentables d’un point de vue strictement financier. C’est une possibilité, et déjà largement utilisée par les grandes associations, tel Greenpeace par exemple. Mais c’est à placer du coté “action” de l’association. Même si une association est active dans ce domaine, elle devra toujours investir les capitaux dont les revenus financent son action. D’où le choix : soit j’investis sans limitation pour obtenir les revenus permettant de soutenir une action la plus forte possible, soit je concède un peu sur l’action pour me permettre d’influer également dans mes investissements. Next Next post: Beware of the vicious data-mining bias !